What would your life be like if something you did at age 6 haunted you every Christmas for the next 50 years? For Karolyn Grimes, it has been a wonderful life. So wonderful, in fact, she turned it into a cottage industry. The child star who played “Zuzu Bailey” in the classic 1946 holiday film, It’s a Wonderful Life, appeared in 18 movies but none of the others inspired conventions, greeting cards, a collector’s plate and trivia contests. • “Clarence Oddbody’s Heavenly Hot Mulled Wine” — The drink Clarence the angel ordered at Nick’s Place. • “South Pacific Honeymoon Chicken” — It makes you think of that night, Grimes says. • “Angel Second Class Pink Lemon Pie” — Light and fluffy, naturally. 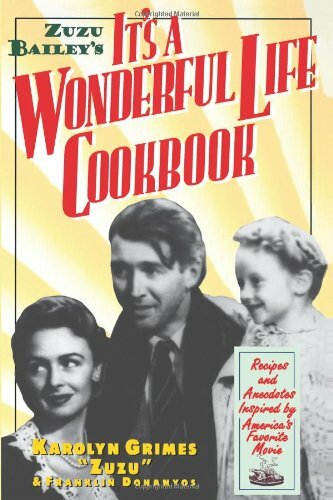 Order ‘Zuzu Bailey’s It’s A Wonderful Life Cookbook: Recipes and Anecdotes Inspired by America’s Favorite Movie,’ written by Karolyn Grimes, available from Amazon.com by clickingthe book cover above! Why a cookbook? “People love It’s A Wonderful Life,” Grimes says. “They always want more of it.” And as the many photos in the cookbook recall, there was plenty of eating and drinking in the movie. But the real reason, says Grimes, a mother of seven, is family. She hopes that a cookbook of wholesome favorites will give families another reason to gather. The nostalgia circuit keeps Grimes busy from September through December. She even hired someone to handle her fan mail. “It’s the most remarkable thing you’d ever think could happen to you,” she says. 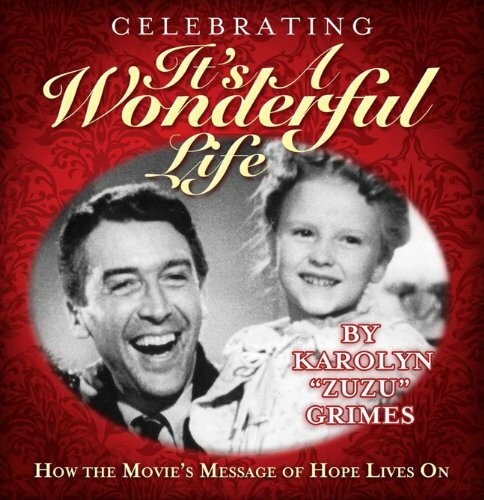 Order ‘Celebrating It’s A Wonderful Life: How the Movie’s Message of Hope Lives On’ by Karolyn Grimes, available from Amazon.com by clicking on the book cover above! Most of the recipes originated with Grimes, but not all. “There was a recipe exchange on the set when they made the movie,” she says, although it’s hard imaging a 6-year-old girl was very interested then. One of the recipes came from Jimmy Stewart’s real mother — “somebody who already got her wings,” Grimes says, referring to the movie’s closing line that made her famous. First of all, she says, Republic does not have the right to market her likeness. And more important to her — they aren’t paying her to do so. Let’s end on an upbeat note. While nearly everyone else on the planet has now watched It’s a Wonderful Life for the thousandth time, what will “Zuzu Bailey” be watching? This is Zuzu all grown up!